Becoming a master chef might not be in the cards for you, but cooking a meal that is guaranteed to impress friends and family is still within your grasp. The free Temperature Cooking Times Template is the perfect way to cook your protein perfectly based on size and cut. You don’t want your guests getting sick from undercooked meals. At the same time, you don’t want to serve people a burned char of meat. Finding that balance is key and that’s exactly what these templates set out to do for you. 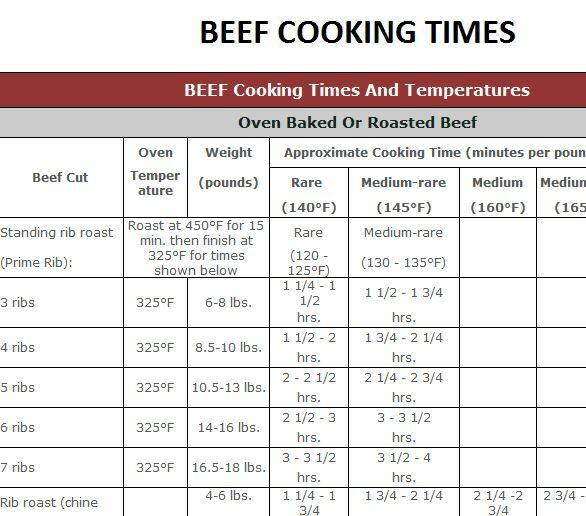 If you want to learn the perfect temperature to cook any meat, simply read the set of instructions and follow along with the guide below. To download the free template file, you will need to follow the link at the bottom of this sheet. Next, you will find a variety of templates at the bottom of this page as well. They tell you exactly what meats they cover. You can choose the one you need or you can download all of them to keep them for future meals. The decision is completely up to you. Next, take a look at the structure of the template (they are set up the same). To the right, you will have the cut and from there temperature, you need to cook the meat at. You can also scroll to the right of the template to find out what temperature to cook your meat based on different criteria and styles. Maybe you want your beef medium-rare, the template provides that and much more. You will also receive the temperatures and settings to cook meat on a grill or even bake it. This template just makes cooking the perfect meal simple and easy for anyone to jump right into cooking.